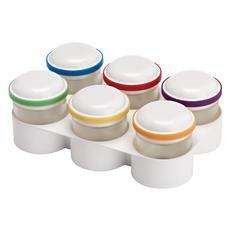 Silicone pods can go directly from freezer to microwave for quick and easy meal preparation. Six colorful food storage pods with stackable freezer tray are convenient for food preparation and storage. Each air-tight silicone pod holds up to 3 ounces of baby food. Pop frozen food out of each flexible storage pod in an instant. Nutritionist and Mom designed to promote healthy habits. BPA Free. Also included is a FREE 30-Page Cookbook. The Dr. Browns storage products help you to keep track of whats on hand, to keep foods fresh, to preserve flavor and to keep the fridge and the diaper bag clean.